Reportedly, industry sources have told CNET that Intel is currently working on a new Atom “micro-architecture”. 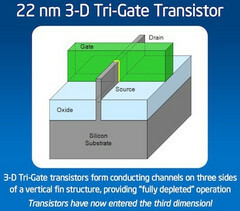 It will apparently top the recently announced 3D transistor technology, which is expected to be used in the manufacturer’s upcoming “Ivy Bridge” chips. “3D” is actually a term employed to indicate that we will not see a flat 2D gate as part of the architecture, but reportedly a three-dimensional one (called Tri-Gate) that would tower above the silicon substrate. Since 2008, when the Atom was first introduced, there has not been a major change in the architecture, so we are excited to find out what the new ones will be like. Presumably, a combination of the Silvermont and the aforementioned Tri-Gate technology should set some baseline standards when it comes to integration, performance and power usage. According to CNET, the new Atom will reportedly demonstrate the same system-on-a-chip composition that we are already used to see and will be based on a 22nm technology. Industry sources familiar with Intel’s plans have also told CNET that Silvermont will hit the market in at some point in 2013.